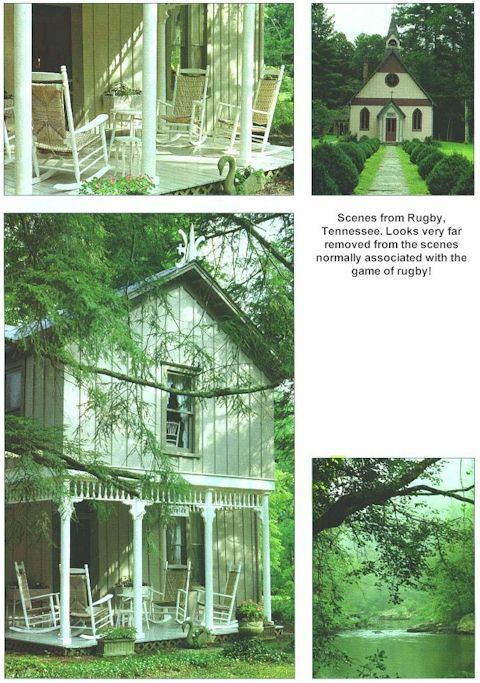 With just eighty-five residents in all, Rugby, Tennessee, is small by any standard. Yet ever since its founding in 1880, this bucolic place has drawn visitors from around the globe, eager to glimpse the utopia it was designed to be. Imagine this curious scenario: A popular author announces a new, cooperative community on a distant continent, open to anyone interested in a life of agricultural work balanced by cultural pursuits. So it was in 1880 when the famous British writer and social reformer Thomas Hughes (author of the best-seller Tom Brown's Schooldays) founded Rugby in America, named for his beloved alma mater. Publicity was intense: British subjects in the farthest reaches of the Empire devoured stories about the new town--Hughes was, after all, a celebrity. Not only did idealistic Americans pull up stakes and head South, but refined, like-minded souls from England made the journey, eager to be part of a town where it was considered noble to "work with their hands, and where even the humblest would be cultured enough to meet princes," to quote Hughes. As it turns out, many Rugbeians interpreted this to mean taking up tennis, penning poetry, or raising a teacup to their lips, rather than getting any serious agricultural work done. 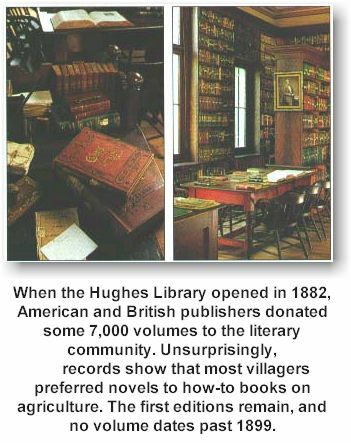 Alas, though the population increased to 450, "like all other utopias, it didn't quite work," notes Barbara Stagg, executive director of Historic Rugby, the organization founded in 1966 to revive the village. "But unlike other utopian communities commemorated today only by markers, we're still here. And the story is far from over. We're living the founder's dream." See for yourself by paying a visit to the Commissary, where the handiwork is finally turning a profit. Here, 120 area craftspeople offer homespun wares like quilts and rocking chairs. Store manager Rita Myers points out, "Our chair maker is the fourth generation, and his son is the fifth. People come from all over to take workshops, which in addition to Southern crafts also include British specialties like English willow baskets and tatting. And once a year, in spring, all those craftspeople demonstrate their techniques at the Festival of British and Appalachian Culture, which includes performers from the British Isles." In truth, curious British visitors trickle in the whole year; one older man rode into town not long ago on a motorcycle as part of his self-devised American tour. He found Rugby so to his liking that he stayed several weeks rather than an afternoon, dining at residents' homes and savoring the British specialties at the local Harrow Road cafe, declaring them quite authentic. Though casual visitors can't expect the same perks, they will be able to tour most of the private residences in the fall of 2000--for instance, the Lindens, top right, home to the great-grandson of the first town planner. In fact, the original town plan was dusted off quite recently. "We're building new homes in an old style, according to the original, unfinished design. And, within a few years, we expect our population to increase to several hundred. We'll even have a bandstand," says Barbara proudly "The National Trust for Historic Preservation confirms there's nothing quite like it." As with Rugby's first founding, new residents snapping up lots are coming from all over. "Many were visitors who passed through Rugby and decided it would be a nice place to live. Some actually say it is utopia--or as close as a town can come." "Cool, bracing, healthful mountain air, fishing and bathing in clear river, charming walks and views, pleasant, light, airy rooms, completely furnished and excellent," rejoiced an 1883 advertisement for Rugby. Today the same claims could truthfully be made. Guests still journey deep into the Cumberland Plateau, two-and-a-half hours from Nashville, to summer at this higher elevation, where the air is cool, the scenery pristine. 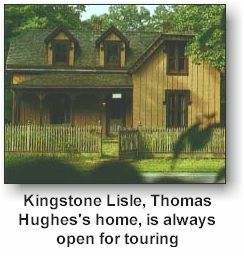 Then as now, 22 original village buildings delight the eye--from Christ Church, with its tiny shingled steeple and diminutive rose window, to private homes like Ingleside, a Carpenter Gothic fantasy, both opposite. Even the promised swimming hole still awaits. As they take in the views, some guests extend their rambles to the 150 miles of trails of Big South Fork National River and Recreation Area, just adjacent to the village, a wildflower and bird lover's paradise. Click here for some Rugby, TN scenes.